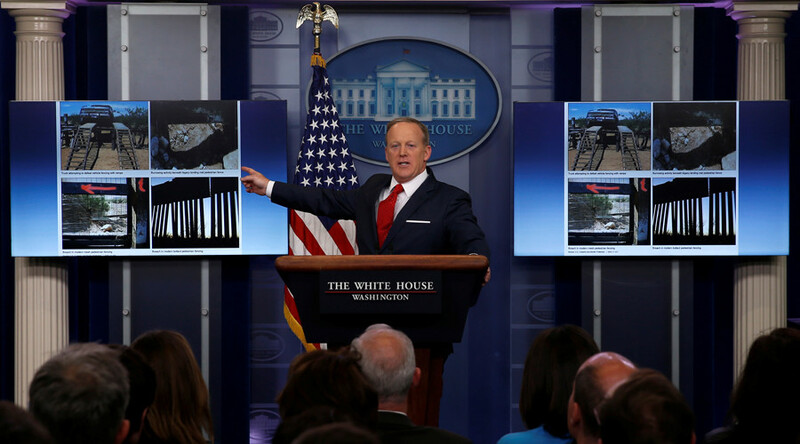 White House Press Secretary Sean Spicer got into a heated debate with a Breitbart journalist over whether President Donald Trump’s much vaunted Mexican border barrier is a wall or merely a fence. Spiering had earlier questioned whether the Trump administration had lied to the public when he promised to build a concrete wall along the southern border, only to water down the project to a fence-like barrier. Spicer responded by producing images of the current border fencing in a state of disrepair along with images depicting how the barrier will look under the new congressional spending bill which grants nearly $500 million for repairs. The new plan includes the erection of “levee” and “bollard” walls in certain stretches along the border. “This is what exists right now throughout our country,” Spicer said as the slideshow revealed the current, tattered-looking, border fences. “There are various types of walls that can be built under the legislation that was just passed,” Spicer responded. “That is a fence,” Spiering stated. “That is called a levee wall, that’s the actual name of it,” Spicer replied. “So that’s the wall Trump promised?” Spiering asked. In the ensuing argument, Spiering accused Spicer of trying to mislead the public into supporting the “existing tough-guy fencing thing” instead of a real wall. The pair failed to resolve the issue during the briefing and Spiering later took aim at the press secretary in his report on Breitbart.com. “Spicer refused to describe his fence photos as Trump’s promised wall to supporters but assured them that it would be effective in protecting the border,” Spiering said.